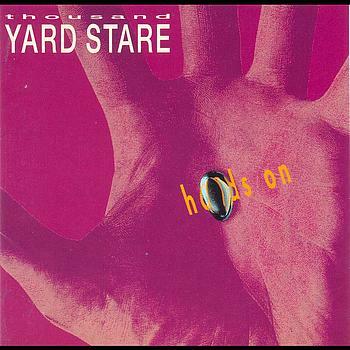 Overlooked Albums of the ’90s – Thousand Yard Stare “Hands On” | "I Prefer Their Old Stuff"
Back to the early nineties now, 1992 to be precise. The baggy days of Madchester were gradually waning, noisy chaps from Seattle were starting to infiltrate the British conciousness and Britpop was still but a fevered dream of tabloid hacks and music mag journalists. At such a time, there were swathes of soundalike bands cropping up hoping to jump onto The Stone Roses’ and Happy Mondays’ bandwagon which may go some way to explaining why Slough band Thousand Yard Stare’s excellent debut album “Hands On” went pretty much unnoticed by the majority of the record buying public. Released on their own, brilliantly titled Stifled Aardvark record label it followed a slew of EPs, the first of which (“Weatherwatching”) prompted the NME to call the band “brightest hope for the future”, unknowingly giving the band the Murray Walker kiss of death! Their sound owed more to The Wonder Stuff than The Stone Roses (in fact the fiddles on football referencing single “0-0 a.e.t” (no score after extra time) came courtesy of The Wonder Stuff’s Martin Bell) but had a harder rockier edge while retaining the danceable groove. I reckon tracks such as “Buttermouth” or “Wideshire” would still get an indie disco dance floor heaving! They were also not afraid to expand their tracks past the standard three minute mark, tracks such as the stand out “Comeuppance” and the aforementioned “Wideshire” both stretch to the six minute mark. Whether this was the reason they didn’t get much radio airplay, I do not know, but I think yet again it may have been a case of unfortunate timing. Radio stations possibly thought the public had had enough of this sort of thing and were looking stateside for ‘fresher’ sounds, maybe if the album been released a couple of years earlier just as the scene was gaining ground it may now be regarded a classic alongside The Stone Roses’ debut or it would at least be remembered by a lot more people! They released a second album “Mappamundi” in 1993 which was not particularly well received and this proved to be the band’s last release and they called it quits soon after. This entry was posted on May 9, 2011, 3:45 pm and is filed under Features. You can follow any responses to this entry through RSS 2.0. You can leave a response, or trackback from your own site.